Part 1 of this series was posted yesterday. In recent years Malta has been rocked with a number of revelations of widespread corruption, erosion of free speech, and degradation of rule of law which tarnished its presidency of the European Union. 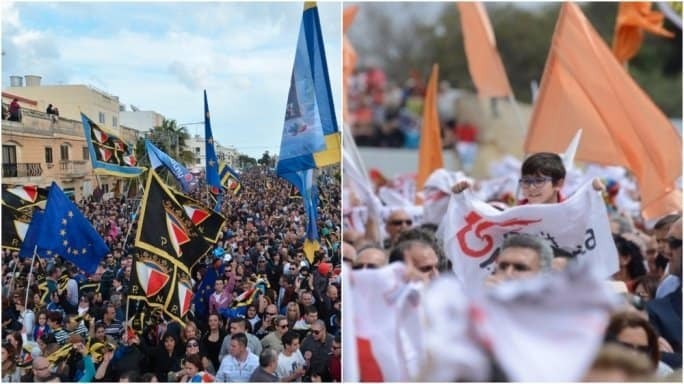 Malta’s Prime Minister Muscat has brushed of these accusations as ”a coordinated attack on Malta by jealous countries”, but in reality, could Malta’s democracy be in danger? Erosion of democracy is triggered when a state lacks some of the most important features of a full democracy: the rule of law, impartial judiciary, separation of powers, elections between multiple distinct parties and civil liberties. 1. A democracy starts to fail when the rule of law and separation of powers erode. Separation of powers implies that the government is divided into 3 independent branches, each with separate powers and areas of responsibility: executive, legislative and judiciary. In a liberal democracy the executive power is in the hands of the government/prime minister, the legislative power is in the parliament/house of representatives, and the judicial power is in the hands of the chief justice/judiciary. In a functioning democracy there should be a a system of checks and balances between these independent branches of the government. And this is where we come to the first obstacle to democracy in Malta: the lack of separation of powers. The tiny Mediterranean Island, visited by over 2 million tourists each year, joined the European Union in 2004. Prior to joining the EU, the European Commission in its pre-accession report of 2003, warned Malta about the need to reform its procedure for the appointment of members of the judiciary, currently controlled by political bodies, in order to improve its objectivity. The Commission also pointed to the need to check the compliance of the procedure for challenging judges and magistrates provided for by Article 738 of the Code of Organisation and Civil Procedure with the principle of an impartial tribunal enshrined in the European Convention on Human Rights. Since 2004 nothing has changed with regards to this problem of rule of law and the risk of a partisan judiciary. Instead, things seem to have gone worse. According to the World Bank’s 2017 Worldwide Governance Indicators, Malta’s rank between 2006 and 2016 has worsened in almost all areas of governance, in particular concerning the areas of the rule of law and control of corruption. The Legal Affairs Committee of the Parliamentary Assembly of the Council of Europe requested the opinion of the Venice Commission on Malta’s situation on the separation of powers and independence of the judiciary. Its findings published in 2018 were, in essence, that parliamentary democracy in Malta is deficient. In Malta, the concentration of powers is almost solely in the hands of the executive organ of the state, namely with the Prime Minister. The President on the advice of the Prime Minister appoints the Attorney General, the Chief Justice, the judges of the superior courts and the Police Commissioner. Hence it is the Prime Minister who alone decides about appointments and removals of these important offices of the state. This lack of separation of powers produces weak legislative and judiciary organs and an almost authoritarian organ of the state. Unlike sometimes thought, the rule of law does not imply that a state has laws and that the laws are obeyed. It refers to the idea that every person in the state is subject to its laws, including the prime minister, the government, law enforcement, and judiciary. In October 2018 several MEPs called the European Commission for a public enquiry into the role of Malta’s government in Daphne Caruana Galizia’s death. They raised concerns about the apparent impunity of the politicians at the center of corruption allegations, as well as about shortcomings in the investigation by the local authorities. Although the men who allegedly triggered the bomb, have been arrested, the mastermind behind the murder is still at large. They noted how Anthony Vella, the enquiring magistrate in the murder, was removed from the case and promoted to be a judge in the middle of the investigation causing for it to be delayed. Prior to that, he had requested for surveillance data which was allegedly withheld from him by the authorities until a new magistrate was nominated on the case. The MEPs also referred to the apparent unwillingness by the authorities to investigate any possible involvement of persons in the government in her murder. Economy Minister Chris Cardona had allegedly been seen with at least one of the killers, prior to and after the assassination. He had a chip on his shoulder against the journalist, as he had sued Daphne Caruana Galizia for libel after she had written about him visiting a brothel in Germany when on official duty. Such accusations against a Minister in liberal democratic countries would already be enough for a resignation, but the Maltese Minister instead went on to garnish the journalist’s bank accounts for 47,000 euros. The case was eventually dropped when the Minister failed to show up in court and he was ordered to pay the heirs of the journalist for the court fees. 2. A democracy starts to fail when there is a limited political pluralism. Malta has a two-party political system that dominates the government. One of the two parties holds a majority in the legislature and is referred to as the majority or governing party while the other is the minority or opposition party. In Malta, the governing party, the ”winner” takes home all: the Prime Minister chooses everyone from the chief justice and the police commissioner to the chairman of the theatre. In essence, there is nothing wrong of course with having a two-party system. Some other Commonwealth countries, as well as the USA also have a two-party political system. However, the two-party system requires a system of separation of powers and checks and balances. In the USA, for instance, there are independent institutions such as the FBI which act as ’checks and balances’ to ensure that not even a member of the judiciary or the President escapes scrutiny. Also, a strong opposition party is a very important safeguard of a democracy. “Power corrupts and absolute power corrupts absolutely”. An effective opposition is necessary to provide checks and balances in the government. Without it, a government becomes dictatorial and unaccountable. The concern in Malta right now is the weakening opposition. Since the appointment of the new leader of the opposition, Adrian Delia, the Nationalist Party has seen divisions and a lack of cohesive policy which has too often been in line with the government’s. 3. A democracy starts to fail when political institutions ignore the prevalence of corruption. Research by the World Bank stated that political institutions are extremely important in determining corruption. Parliamentary systems, political stability and freedom of the press, in turn, are associated with lower levels of corruption. So far the Prime Minister of Malta has denied all accusations of corruption and has failed to act on Minister Konrad Mizzi and his chief of staff Keith Schembri, who were both named in the Panama Papers and have been accused of money laundering. Panama revelations lead to not only resignations in other European countries such as Iceland, Ukraine and Spain, but also around the world. The former Prime Minister of Pakistan resigned but was also sentenced to 7 years imprisonment for corruption. Comparisons have been made between Malta and Slovakia too. After the murder of investigative journalist Jan Kuciak in February 2018, the Slovak Prime Minister and police chief both resigned. However, in Malta, there have been no resignations what so ever after the assassination of Daphne Caruana Galizia. 4. A democracy starts to fail when a government fails in the effective power to govern. Governments might cave in for economic, or other pressures from the outside and hand out resources in exchange for votes and loyalty. Prior to the snap elections of 2017 in Malta, the Prime Minister’s Labour Party was accused of bribes: first there were the allegations of baskets of fruit sent to voters, then there were the reports of random phone calls from the Labour Party’s offices asking voters ”what they needed”, and finally, an extraordinary spike in government jobs and promotions. In authoritarian countries the oligarchs manage to press the government for fulfilling their interests. We have also witnessed this first hand in Malta by the endemic dishing out of planning permissions and public land to the local elite and property developers. This practice creates a loyalist group of government supporters but makes the state eventually a mere puppet of the oligarchs. The Government becomes a henchman of the rich developers. 5. A democracy starts to fail when the government represses opposing voices and civil liberties. Freedom of speech, press and assembly act as a curb on corruption and misuse of resources. The main obstacle to full press freedom and thus full democracy in Malta is the state ownership of public media. Many authoritarian regimes such as China (CCTV), Russia (RT), and Venezuela (TeleSUR) use state media to filter and spin the news they allow to go out to the public. The news media are more independent and fewer journalists are arrested, detained, harassed or killed in countries with less state control. The disappearance of traditional ’gatekeepers’ of knowledge has lead to a situation where a large fraction of the population believes opinions to be ”verifiable facts”. In essence, people easily tend to believe any fake news they might read, especially coming from the Government sources. Before her death, Daphne Caruana Galizia was arrested several times by the Maltese police for her articles. She endured years of harassment and threats by the Labor party she criticized, and she had 47 defamation lawsuits against her, many instituted by Government Ministers including the Prime Minister Joseph Muscat and opposition leader Adrian Delia as well as many others. Authoritarian regimes may deny other civil liberties such as civil protests. After the murder of Daphne Caruana Galizia, there have been continuous attempts by the Government to remove the memorial and protest site for justice set out for the murdered journalist. One of the last times the order for the removal was done by the Justice Minister, Owen Bonnici himself. International free speech organizations are concerned about the lack of freedom of speech in Malta. Freedom of expression is the essence of democracy and crucial to a healthy governance system. Free speech is enshrined in constitutions, and in the Universal Declaration of Human Rights. It can perhaps be said to be the most important of human rights because without it violations of the other rights cannot be addressed. Free speech is an important weapon to reveal corruption and those in a democracy who use their power for personal gain. Methods to silence those who speak up are many: law-suits for defamation, harassment and as a final resort, death.